I don't have a lot of Yugoslavian Eurovision singles, but I do love them, because I quite like the fact that I actually own singles from a country that does not exist anymore. 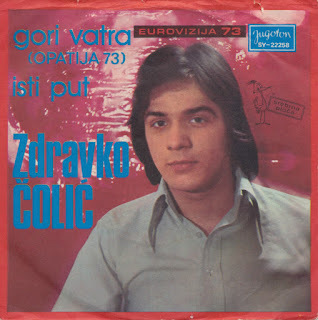 These days you won't find a record with the words 'Made in Yugoslavia' anymore. Zdravko Čolić represented Yugoslavia in the Eurovision Song Contest in 1973 with the song 'Gori Vatra' ('The fire is burning'). The love song describes the love between him and his lover as a fire, burning inside them.The song did not impress the juries: with 65 points the song ended up in 15th place out of 17 contestants. Čolić has been described as Serbia's Tom Jones, and when you listen to this song, you can understand why. What a voice.